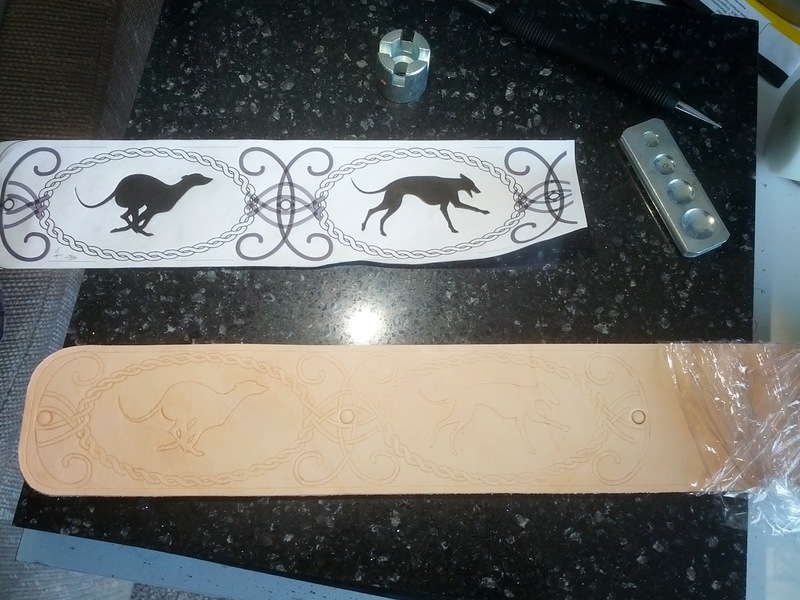 I've been working on this order for about 5 weeks at this point but it's finally complete with this last guitar strap. It would have been finished last week except the lining was damaged (stain mishap) during its installation so I had to pull it off and install a new lining from scratch. But all in all it came out pretty well. This one was a little more "artsy" than the others, entailing several rounds of drafting and a few more days of tooling. 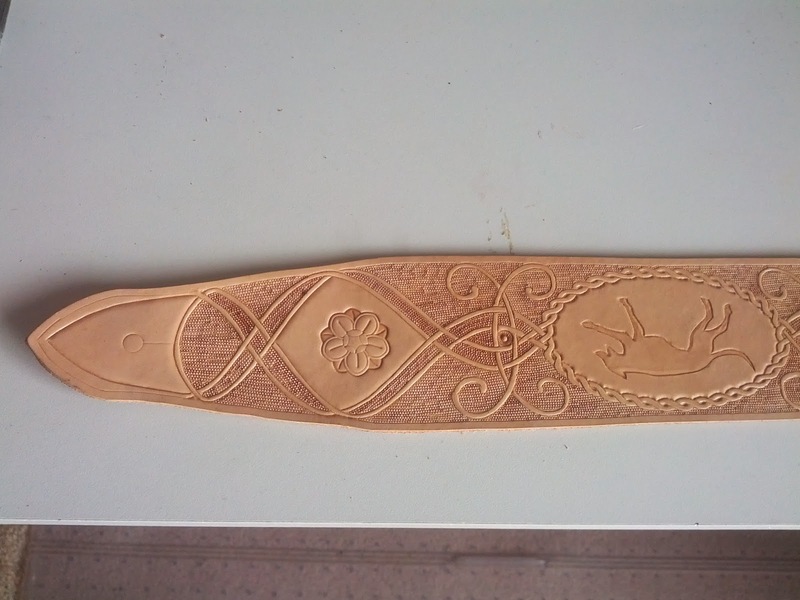 The client liked elements of vines, celtic knotwork, and sheridan carving (also greyhounds) so I tried to work all of those into a single piece of leather about 2.5 x 32". It was certainly a challenge but worth it in the end. I think the bargrounder worked pretty well for the background, even if it warped the leather a tad in a spot or two. I might wish the resist had worked more uniformly but it's enough to be noticeable and the tinting came out pretty spot on. As previously mentioned, this was the third and final guitar strap in a set of three all custom made for the client's family. The entire set is now on its way for some uniquely family rocking out time. Turns out I'll need to give these their own listing in Etsy but I'm all stocked up in case they become popular. With the latigo anchor they're pretty solid. The second guitar strap of the order (same as the Runic Bard Guitar Strap) turned out to emulate Pink Floyd's "The Wall" album cover. 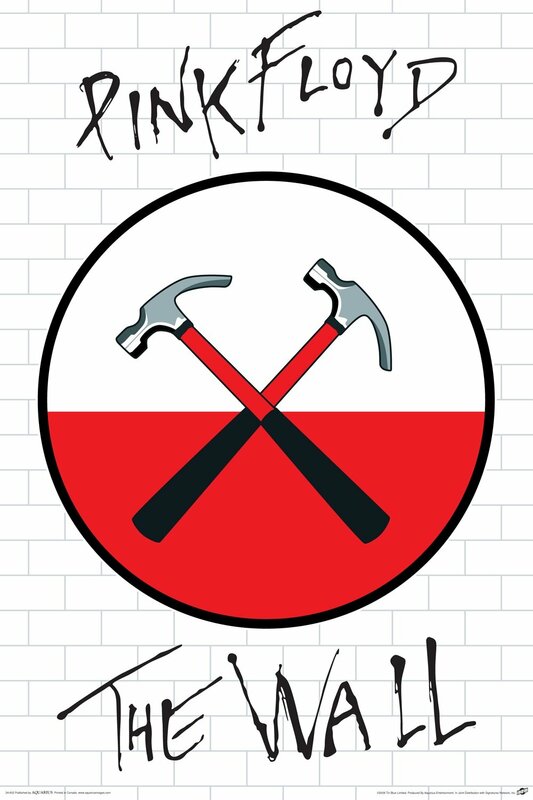 Bricks on their own aren't the most striking design so I added a painted applique of the crossed hammers from the album art. That was probably the trickiest part since leather generally doesn't want to be white. I was quite happy to hear that the client who ordered the Klingon Belt Pouch was very happy with it. I'm sure he must have been because right after he left his review I received two more orders for the same pouch. One of these clients requested that I find a way to better match the texture of the original prop and that took some doing. After combing through the materials available for me a few more times I decided to take a chance on deerskin. It's natural texture was a fair bit closer to the original's, but deerskin is very elastic and very tricky to cut with much precision. This pattern involves some fairly tight tolerances and I wasn't sure if deerskin could meet those specs. At the same time, since the integrity of the pouch relies on a certain amount of tension I wasn't sure how the super elastic deerskin would hold together. So I made a proof of concept or two to test those concerns and then went ahead and made the pouches. I think the deerskin is structurally sound, but I've no doubt the stoned oil is more durable. In either case, these two seem to have turned out ok and it's now a choice that I can offer prospective clients. 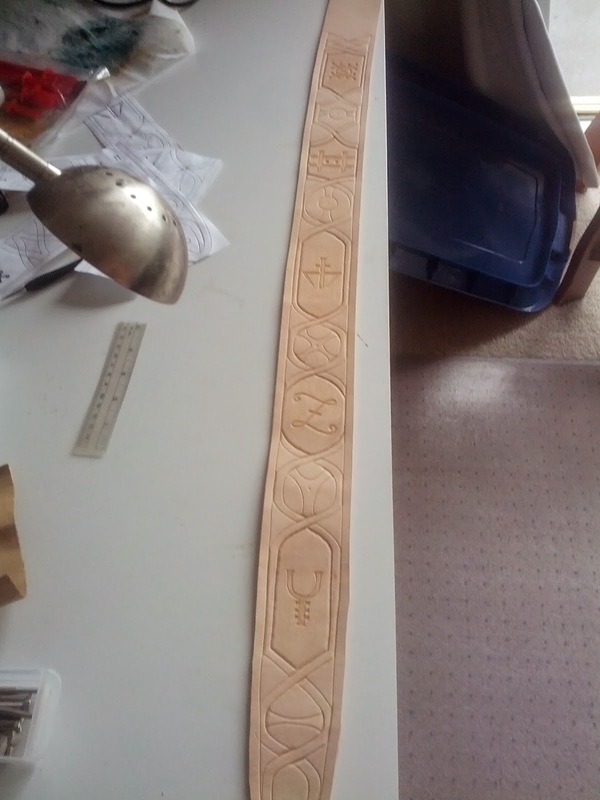 The was the first guitar strap in an order of three but since guitar straps take a fair while to complete I figured I'd post each one as they finish up. 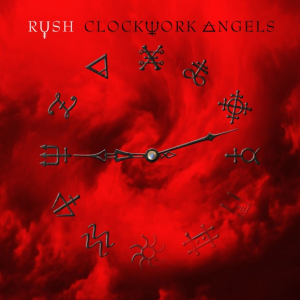 In this case, the client had a piece of album art work (Rush's Clockwork Angels) that they wanted to use as the basis. It did take awhile but we were able to come up with a design that incorporated the elements he wanted. One choice that was made was to use an overlay to feature the runes while allowing the background, made with milled veg-tan, to show up behind it. Overlays tend to make everything a lot more complicated but I'm pretty content with how this one turned out. I wound up pairing down the number of slots in the strap, but the strip is adjusted so that the total length is still within specs. It's about 2-3 times as thick as the normal guitar strap but most of that is the milled leather and it's still about as flexible as any other guitar strap. The completed pictures were taken as the sun's going down here but I don't think the lighting is affecting the photos -too- much. I might try to get some more photos before the whole thing is shipped off (probably in some weeks).